Should you talk on your phone while cycling? If my phone rings while I’m cycling, normally I won’t answer. I’m basically concerned for my safety – I’m not sure I could co-ordinate riding along and digging my phone out of my pocket at the same time. Unfortunately some callers seem to have an uncanny knack of knowing when I’m on my bike, and will keep phoning until I stop. I think the record so far is five calls before I finally gave up and pulled over. If you see someone riding along with a Vampire Weekend ringtone playing on repeat – that’s me. So if you’re caught using your mobile while riding your bike, you could be accused of either careless or inconsiderate cycling. These offences are essentially the same, and depend on whether you’re riding with the degree of care to be expected of a reasonable and competent cyclist. Both carry a maximum fine of £1,000. What are the chances of finding yourself in legal trouble if you phone while riding? The first question is whether the police are even likely to pull you over. Sergeant Wolfson says that he’s more inclined to stop someone if he thinks they are “likely to harm themselves or anyone else”. Different police forces will take different approaches to this, but it will probably depend at least in part on whether you appear to be in control. If you are pulled over, you can probably expect at least a talking to – “words of advice” as Sergeant Wolfson kindly calls them. But the police don’t have the power to issue fixed penalty notices for careless or inconsiderate cycling, so if they want to impose a fine, they have to bring a prosecution in court. The courts have quite a nuanced approach when judging offences like these. They will take into account various factors such as what the traffic conditions were like, how much control you had over your bike and whether you obeyed the Highway Code (which says nothing specifically about phoning while cycling). Generally the busier the road, and the more difficulty you would have had reacting to the unexpected, the more likely you might be found to have cycled carelessly. 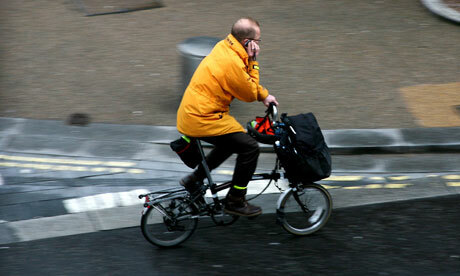 So far there don’t seem to have been many successful prosecutions for careless cycling based on using a mobile. Sergeant Wolfson couldn’t recall a case where the City police had brought a prosecution for this. Of course if you injure someone a prosecution is much more likely, but probably under different legal provisions. What do bike blog readers think? Do you talk on your phone while cycling, and should it be illegal? Jorren Knibbe is a barrister and writes a blog on cycle law. This article is for general information only, and is not intended as legal advice. well it wouldnt be a cyclist lobby without advocating for cyclist freedom to do whatever they want on the road while, at the same time, insisting on bicycles being treated as a vehicle and accorded the same rights as motorised traffic! 2. enforcement of existing legislation regarding max 2 abreast when riding in groups – together with the measure outlined in 1 above. 4. Strict new laws regarding acceptable behaviour on the roads by cyclist groups e.g. club events and the likes. 5. Hopefully with block head Dempsey gone from transport, the anticipated rescinding of the SI compelling mandatory use of dedicated cycle tracks will not come to pass. I would advocate for the tightening up of the law in this area to include all cycle tracks and cycle paths i.e. remove the ridiculous definition of a cycle track so that all cycle facilities, where provided, become mandatory use. The cycle lobby groups can then spend their time advocating for better standards for these facilities but their mandatory use makes the roads safer for everyone! It’s a re-post of an article from The Guardian, and clearly marked as such. There is no editorialising by Cyclist.ie before or after the article, so I think we can be fully confident that this is not Cyclist.ie advocating for cyclists to be allowed to do whatever they like. It’s just an article of interest to cyclists that has been reposted here. The UKcyclerules site mentioned in the article is very interesting. I wonder whether anyone has planned an Irish version of same, or whether one exists already.